Giveaway, and its international too! You know those books that beg to be read in one sitting? Well,this is one of those books. 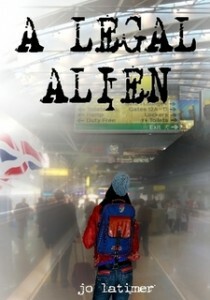 A legal Alien by Jo Latimer is a delightful, unputdownable, hilarious look at a South African in London. You know the ones, taking the obligatory 2 year stint in the UK. Not knowing what on earth to expect and then once there, being completely taken aback by the weather? Well, this is exactly what this book is about. I received this book on Tuesday and by Wednesday it had been fully read, I laughed at least twice in the first couple of pages and was completely enamoured by the main female character Alex. Basically, the story is told via emails between Alex and friends and family. But, this is not one of those email books which are long-winded and boring, they get to the crunch and like all of us, sometimes only one liners are sent. The hungover days when the fingers refuse to type and the head is pounding. Alex has arrived in London, from Sunny South Africa, (and for those of you have made the transition between these two countries can vouch for the extreme weather surprise) and the emails tell us her story. They contain stories about the travels Alex goes on, the people she meets, the weather and intertwined between all these, a love story blossoms. This book also contains ‘survival tips’ which just adds to the humour and good nature of traveling abroad. I urge you to read this! If you have any sort of funny bone, this surely will tickle it. So, because Christmas has officially packed its bags and left, no more pressies from Santa, and at least another 360 days till the next time, we have a pressie for you from The Book Club Blog. A giveaway of this book. Not just one giveaway, we have two books waiting for new owners, to be gently pawed and fawned over. BUT,hold onto your seats, this is not just any a giveaway, this is international! All you need to do, is leave a comment, with your email (in case you get picked)and your website/blog address and hold thumbs that random.org chooses you.The closing date is 15th January 2010, and once the winners have been announced, I will email to find out what your postal addresses are in order to get the book winging over to you in no time. This book sounds really good; thanks for the chance to win! You convinced me. I would like to read this one. This sounds like a great book, thanks for the giveaway! Oh that sounds like a great book! I have not suffered culture shock to that extreme luckily. Thank you for the giveaway! I am desparate need of some new reading material & this def sounds interesting! I am always looking for a good book and this sounds great. Thanks for the chance. I have read it awesome book. Very Very Funny. I too have read it – its a lovely book full of giggles! I couldn’t put it down, read in one day! Based on your great review I want to read this book. Thanks for the giveaway. Yes please, sounds like an interesting read! Sounds charming! Thanks for the chance! I’d love to win this book! Sounds like a fun, fast read. sounds just up my alley! Thanks for the chance to win a copy – would love to read this!